Discontinued. Please visit the SBS-6500 Battery Impedance Tester product page. The SBS-6000 battery analyzer is a powerful handheld storage battery tester which meets all IEEE/NERC standards. It is a multi-purpose internal resistance and voltage testing kit for batteries from 1.2 to 48 Vdc. 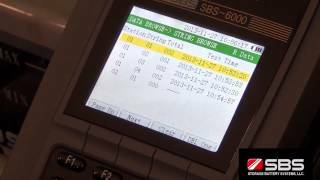 The SBS-6000 transmits test data through RS232 or RJ45 ports. When combined with our SBS-2003 hydrometer, our SBS-6000 resistance tester provides an all-in-one solution for your battery testing needs. Size and Weight 4.25"W x 1.97"D x 7.5"H; 2.2 lbs.